Gary Ross’ movies are nothing if not sincere and, generally speaking, kindhearted. This time around, the writer/director behind “Pleasantville,” “Seabiscuit” and the first “Hunger Games” tackles far tougher material with “Free State of Jones,” a biopic mostly about Confederate Army medic Newton Knight (Matthew McConaughey). The film is often unwieldy, narratively speaking, but it’s also not without passion, telling a story that is frequently more brutal than inspiring. The year is 1963, and though Newton has apprehensively signed up to fight in the Civil War, he opposes slavery and the ways of the Confederate Army. After his nephew is killed in combat, Knight becomes a deserter, sick of fighting in a war that he doesn’t believe in. He returns to Jones County, where he’s hunted by Confederates, and eventually flees with his wife Serena (Keri Russell), who ends up leaving Jonestown altogether. While hiding out in a swamp, Newt meets a group of escaped slaves, including Moses (Mahershala Ali) and his future wife Rachel (Gugu Mbatha-Raw), both of whom he develops close bonds to. Newton, Moses and others lead a rebellion against the Confederates, which is only the setup to a story that covers more time than one would think. 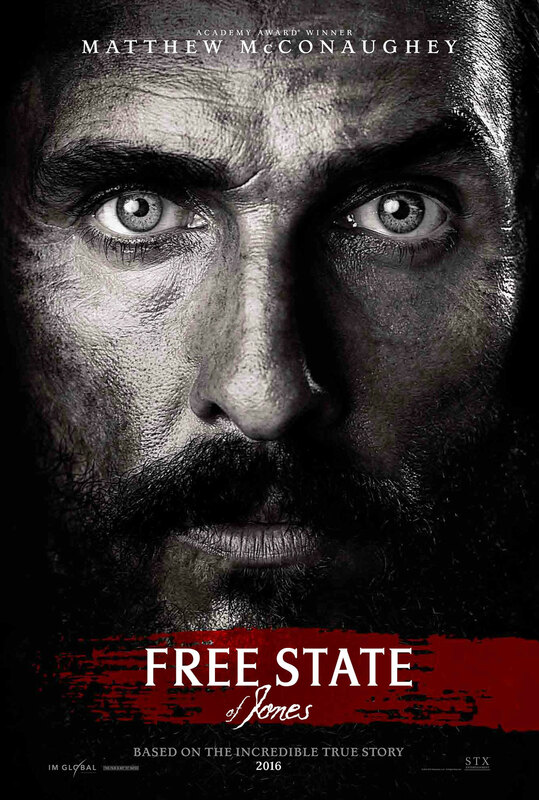 It’s easy to imagine the “white savior” version of “Free State of Jones,” but this isn’t that story, and Ross doesn’t treat it as such. The side characters, mostly Moses and Rachel, are at the forefront of this story almost as much as Newton Knight. Their arcs and struggles are the emotional backbone of the film. Of course, Jones is the lead, but this isn’t only his story. As for whether this is a white savior story, this is a film filled more with loss and pain than it is with Newton saving the day, and the characters he’s surrounded by often find the courage in themselves to stand up without his assistance. Most of the tropes linked to white savior stories are not present in here. Newton Knight is an inspiring figure, but he’s no more inspiring than Moses and other supporting characters.